After Trine-E and Zu-Zana got The Doctor wearing a little colour last season, let’s see if this year he can take those rules to a new high and show some style at last! 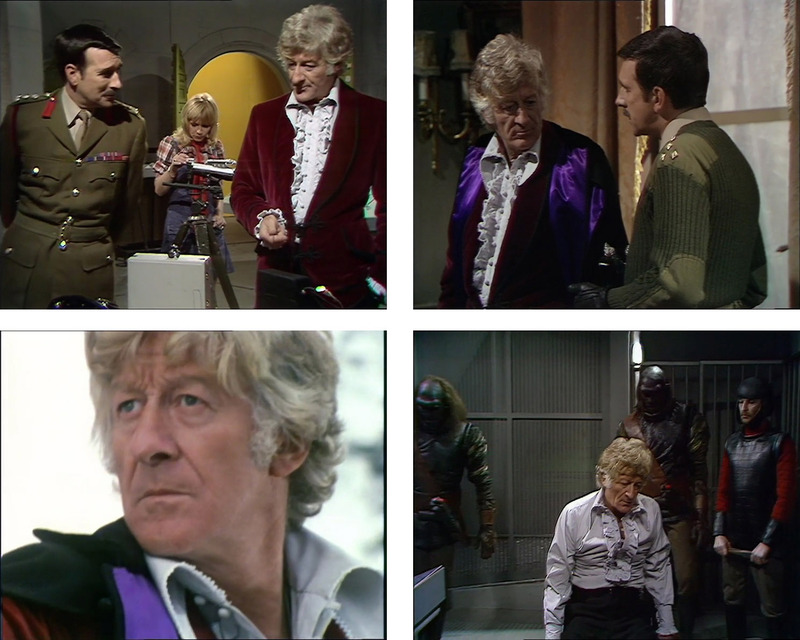 The Doctor starts off the season with his maroon smoking jacket with a rolled collar, black cord piping and double frog-fastening; gone is the zip-fronted shirt to be replaced by a button-fronted shirt of a similar style, with an enormous collar; no cravat; the purple-lined black Inverness Cape also gets an outing. 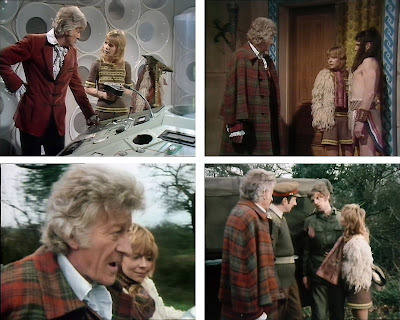 The new DVD release contains a fully restored version of the story, and you can see some nice detail on the shirt, which has covered buttons and loops to fasten it (see right). For this story we get an almost entirely new outfit. 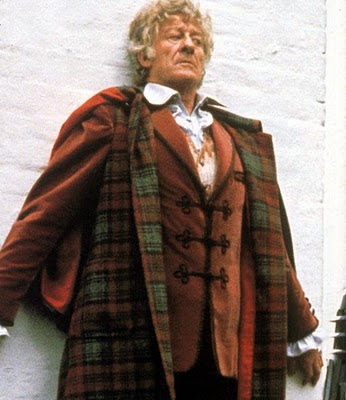 He now wears a rust-red velvet smoking jacket with a notched collar, black cord piping (even around the breast pocket, (see below top right) with a triple frog-fastening; another new button-fronted shirt, this time with a large collar; and a brand new red and green tartan heavy-weight Inverness Cape with a triple strap-button fastening (see below bottom left). The design of this Inverness Cape differs from the black ones, in that the cape is in a single piece spanning the back (see below bottom right), and not two separate wings. Also new and unique here is a waistcoat, the first Jon Pertwee wears. 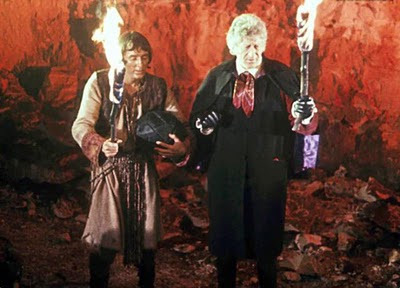 It is hidden for a majority of the episode, only coming to view during the pit fight with the King’s campion (see right). 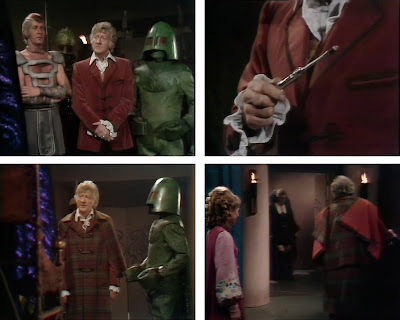 This story feels like a let down now, with The Doctor returning to the midnight blue rolled-collar velvet smoking jacket with a single frog-fastening; the red silk lined, (now) frog-fastened black Inverness Cape; with the new button-fronted frilly shirt with enormous sized lapels; and black silk cravat. Another costume change brings the return of the maroon velvet smoking jacket with a rolled collar, black cord piping and double frog-fastening; the purple-lined Inverness Cape with frog-fastening; the frilled button-fronted shirt; and unique to this story, a patterned silk cravat (see below left). This is not the cravat previously seen in The Deamons. The next story brings a return of the outfit last seen in The Curse of Peladon, made up of the rust-red velvet smoking jacket with a notched collar, black cord piping and triple frog-fastening; new button-fronted shirt with a large collar; and the red and green tartan heavy-weight Inverness Cape with triple strap-button fastening. A little curio has emerged through doing this study. 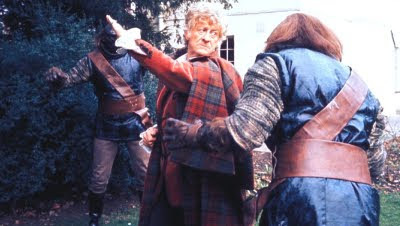 The publicity still below, showing The Doctor taking on a couple of Ogrons is not quite right. 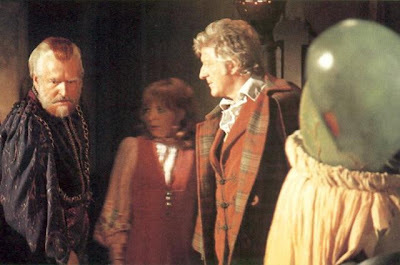 Jon Pertwee is seen wearing his red-green tartan Inverness Cape, which he does not wear in The Day Of The Daleks! After clinging onto those funeral clothes since his first year, it looks like we’ve seen them for the last time! 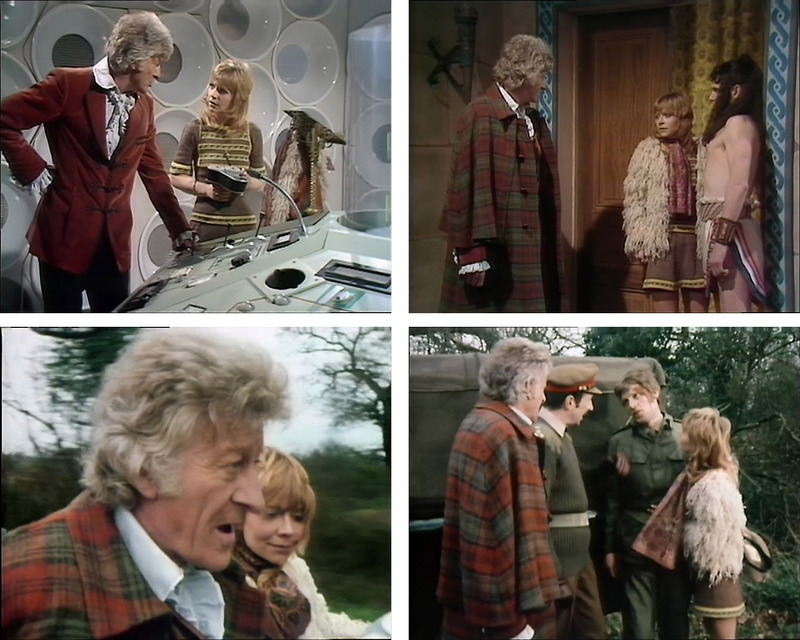 Big, bold tartan patterns; lots of colour (even if that maroon and rust-red smoking jacket could be confused for each other); some paisley patterns there too. 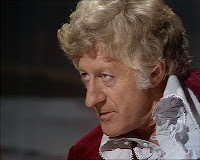 And at last, he starts to relax, wearing his shirt without that dark cravat, letting that top button open for a change. Are we seeing the beginnings of medalion-man? Yes - he certainly did, but for his first season he stuck with one outfit, but by the end he wore something different every story. I was interested in seeing when things changed and how many jacket and capes there actually were. 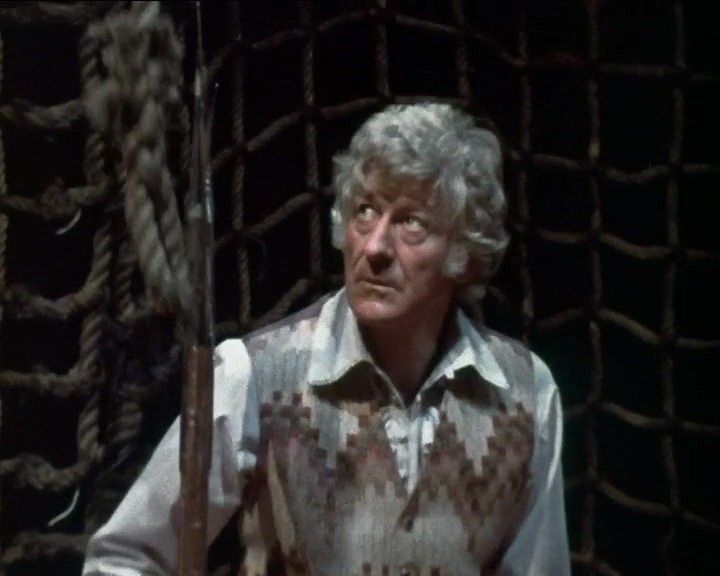 Apropos "The Sea Devils," Pertwee wore his grandfather's cloak (i.e. 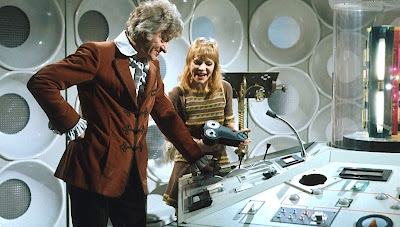 the calf-length, Season 8 original with the moire buttons), for which there was apparently no duplicate, on location. The garment was evidently damaged (something which should come as no surprise if you watch the motorboat chase in which the Doctor inexplicably appears suddenly sans jacket), since it was replaced for studio recording with a shorter (on-knee), frogged garment akin to the one introduced in "Terror of the Autons": indeed, it may even have been the same garment, temporarily re-lined (you'll notice the lining hangs curiously, and even appears not to be hemmed at the bottom in some shots). 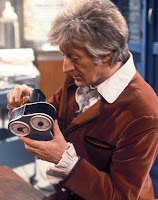 Pertwee's own Inverness was never used again. 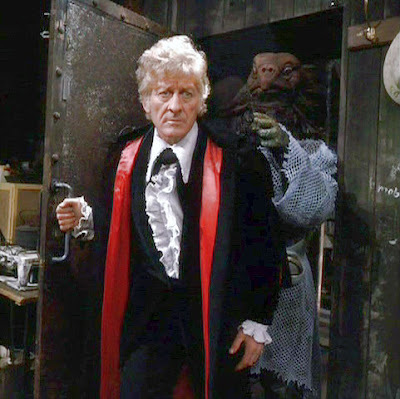 Actually, as a rider to the last, I've checked my notes, and it seems likely that this cloak was acquired/made specially for The Sea Devils; the frogs are cinquefoil rather than trefoil in form, which indicates that it is not the garment first seen in "Terror" -- and suggests also that the garment was perhaps re-used in "The Three Doctors" with a new lining, since that one also has cinquefoil frogs. Hey Piers - I wonder of you could contact me direct at tennantcoat@me.com as I would very much like to discuss your comments further and maybe amend my write-up accordingly.